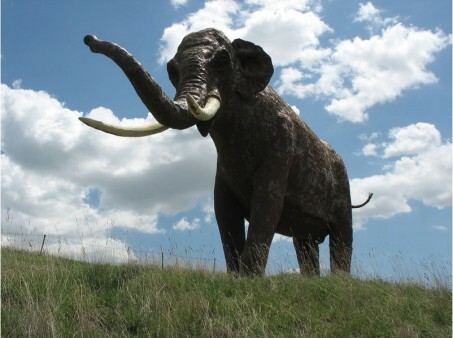 The temperate-zone straight-tusked elephant (Elephas antiquus) is one of the many large mammals that a new study from Aarhus University estimates would have occurred in present-day northern Europe if modern humans had never existed. Unfortunately, the species is now globally extinct and this illustration only a reconstruction. (Photo: Wikimedia Commons). What would the world map of mammals look like if modern man (Homo sapiens) had never existed? In a world without humans, most of northern Europe would probably now be home to not only wolves, Eurasian elk (moose) and bears, but also animals such as elephants and rhinoceroses, new study shows. The fact that the greatest diversity of large mammals is found in Africa reflects past human activities – and not climatic or other environmental constraints. This is determined in a new study, which presents what the world map of mammals would look like if modern man (Homo sapiens) had never existed. This is demonstrated in a new study conducted by researchers from Aarhus University, Denmark. In a previous analysis, they showed that the mass extinction of large mammals during the Last Ice Age and in subsequent millennia (late Quaternary megafauna extinction) is largely explainable from the expansion of modern man (Homo sapiens) across the world. In this follow-up study, they investigate what the natural worldwide diversity patterns of mammals would be like in the absence of past and present human impacts, based on estimates of the natural distribution of each species according to its ecology, biogeography and the current natural environmental template. They provide the first estimate of how the mammal diversity world map would have appeared without the impact of modern man. “Northern Europe is far from the only place in which humans have reduced the diversity of mammals – it’s a worldwide phenomenon. And, in most places, there’s a very large deficit in mammal diversity relative to what it would naturally have been,” says Professor Jens-Christian Svenning, Department of Bioscience, Aarhus University, who is one of the researchers behind the study. “Most safaris today take place in Africa, but under natural circumstances, as many or even more large animals would no doubt have existed in other places, e.g. notably parts of the New World such as Texas and neighbouring areas and the region around northern Argentina-southern Brazil. The reason that many safaris target Africa is not because the continent is naturally abnormally rich in species of mammals. Instead it reflects that it’s one of the only places where human activities have not yet wiped out most of the large animals,” says Postdoctoral Fellow Søren Faurby, Department of Bioscience, Aarhus University, who is the lead author on the study. The existence of Africa’s many species of mammals is thus not due to an optimal climate and environment, but rather because it is the only place where they have not yet been eradicated by humans. The underlying reason includes evolutionary adaptation of large mammals to humans as well as greater pest pressure on human populations in long-inhabited Africa in the past. The study’s openly accessible data set of natural range maps for all late Quaternary mammals provides researchers with the first opportunity to analyse the natural patterns in the species diversity and composition of mammals worldwide. Hereby, it can be used to provide a better understanding of the natural factors that determine the biodiversity in a specific area. “The current high level of biodiversity in mountainous areas is partly due to the fact that the mountains have acted as a refuge for species in relation to hunting and habitat destruction, rather than being a purely natural pattern. An example in Europe is the brown bear, which now virtually only lives in mountainous regions because it has been exterminated from the more accessible and most often more densely populated lowland areas,” explains Søren Faurby. This new study can thus provide an important baseline for nature restoration and conservation.